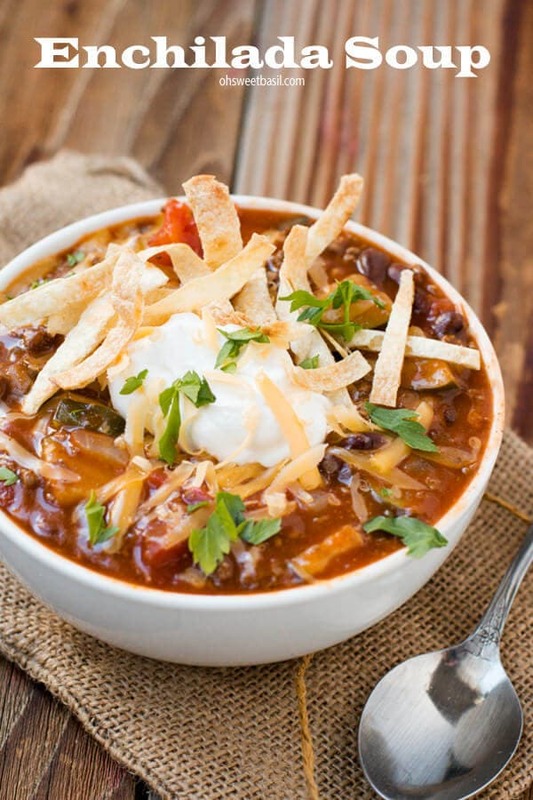 Is there anything better than a dark, chilly, rainy day and a big ol’ pot of soup? 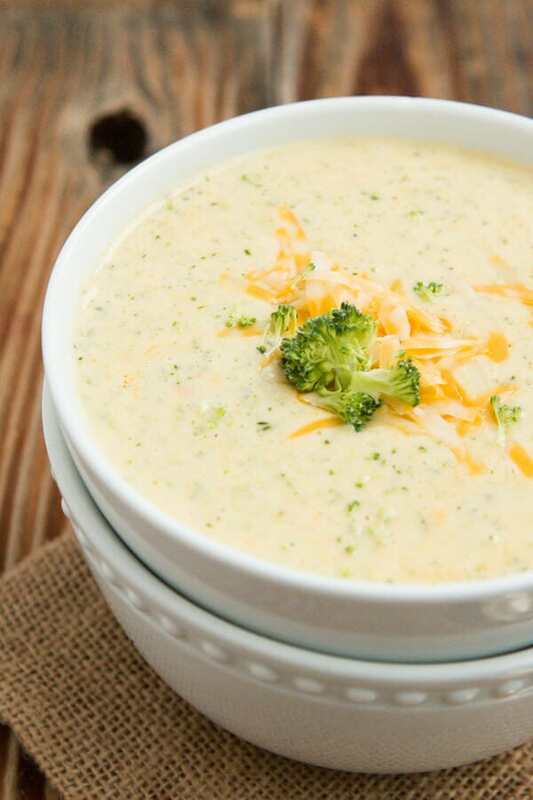 Especially broccoli cheese soup because it’s like the perfect comfort food. I had originally planned to make, and in fact I had already started, this One Pot Lasagna Pasta which is gosh darn delicious, but then out of no where the sun completely disappeared and the sky turned black. It was coming and although my one pot dish is also great for comfort food there was also no way that I was going to attempt to photograph a recipe with zero light. Yes, this is the life of a food blogger. So I busted out the broccoli that needed to be used and started on a soup. This was the first time I’d ever had broccoli cheese soup (gasp! ), and we fell in love with it. 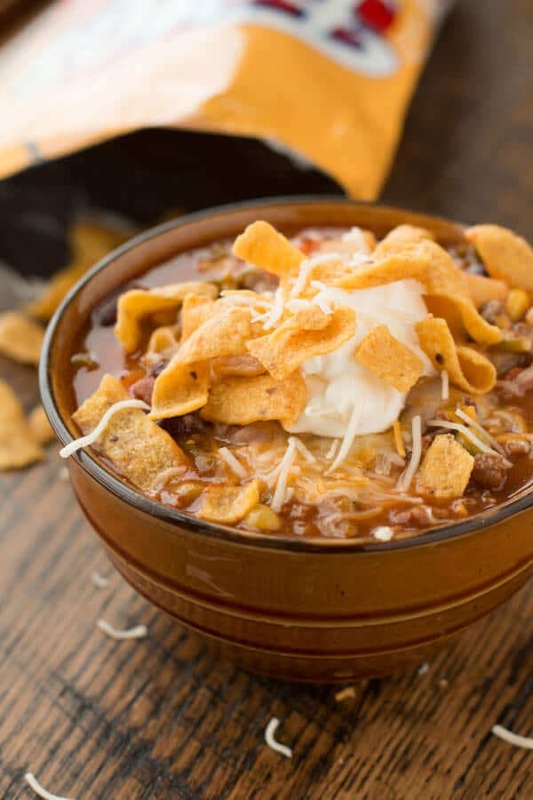 After a little experimenting we ended up with a combo we think you’ll just love and it’s best to just throw it all in the crock pot or slow cooker or even a lunch lady pot and just let the whole thing simmer and then at the end add the broccoli and cheese. We personally like to puree ours right before serving, but if you like the chunks (we do like a few) go for it! Whatever makes you happy. And next time we are totally serving in bread bowls. Boom. Broccoli is high in fiber, very high in vitamin C and has potassium, B6 and vitamin A. Broccoli is good for the immune system. 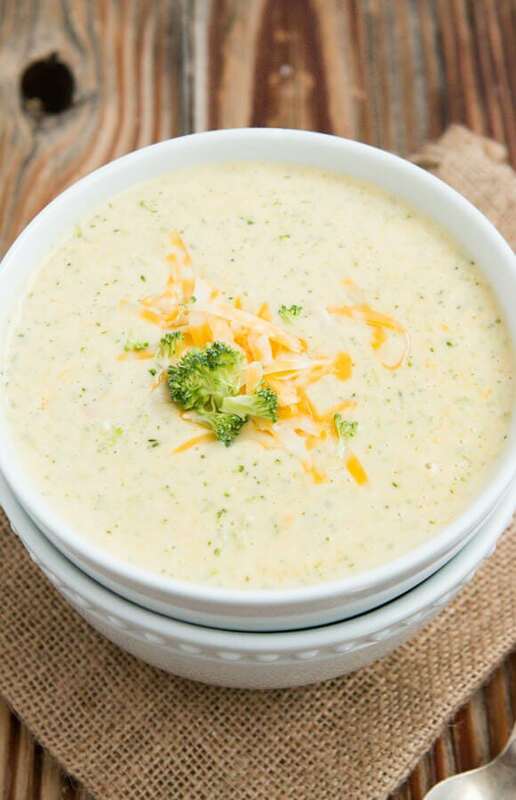 Broccoli Cheese Soup should be kept refrigerated in a covered glass or plastic container. 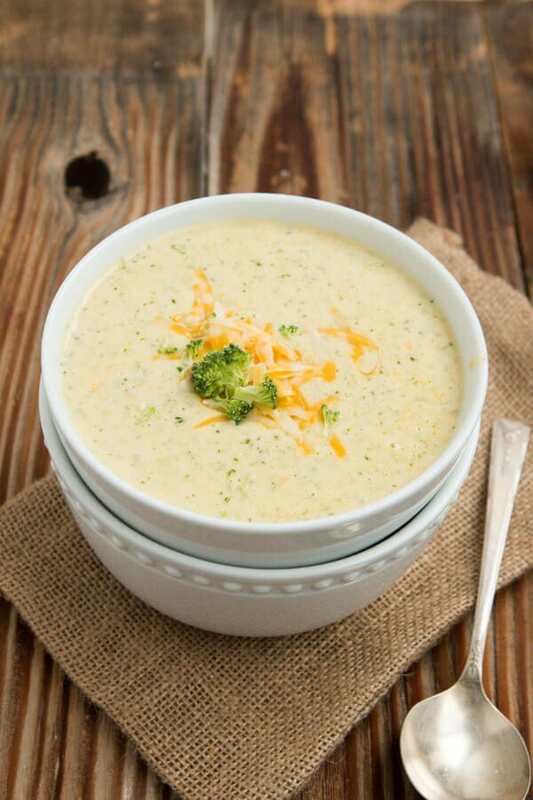 Broccoli cheese soup will keep for 3-4 days in the refrigerator. To freeze broccoli cheese soup, chill the soup and put into airtight containers (allowing a little space for expansion as the soup freezes). Heat a large pot to medium heat or start in the slow cooker. 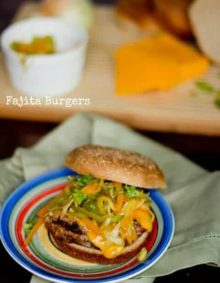 Add the butter, melt down, then add onion and carrot. 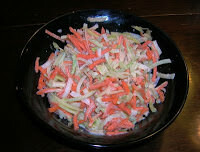 Stir occasionally and allow to cook for 2-3 minutes or until tender. Whisk in the flour and allow to cook for another minute, stirring. Quickly add the broth, cream, half and half, milk, nutmeg and worcestershire. Stir to combine and allow to come to a boil then turn down to simmer until thick, about 15 to 20 minutes. If using a slow cooker, allow to cook on low for 4 hours or high for 2. Add the broccoli and cheeses as well as seasoning. 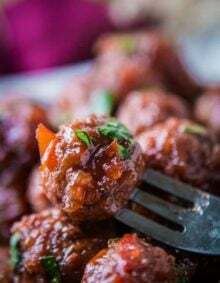 Cook for 10 minutes or until broccoli is tender then puree in batches to desired consistency. 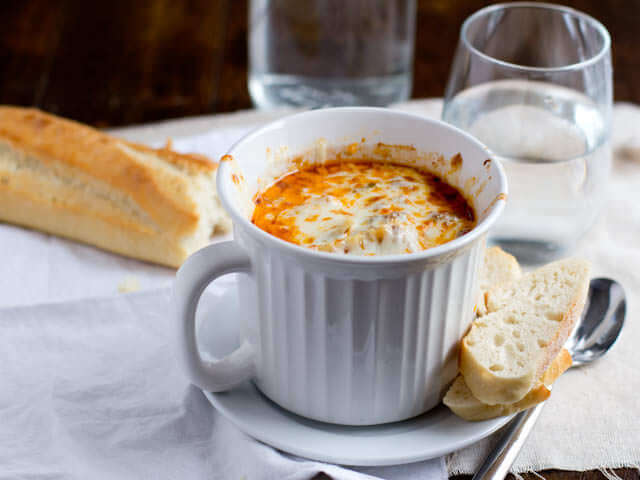 Seriously, is there anything better than a big, warm, bowl of soup during Fall and Winter? I can’t think of anything better to eat. This looks incredible! 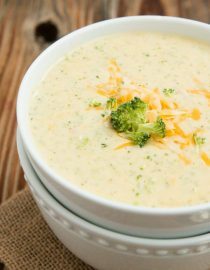 I wish I could get my kids to eat broccoli more, because I love this soup! Looks fabulous! Oh, it is the one veggie, well and spinach that for some reason they both love. I was NOT that way when I was little. I made broccoli cheese and potato soup just last night! I have a bit more perfecting to do, but I’m like you and like to puree the veg right in. Looks good! Oh, I love the potato add in! Thanks, girl! 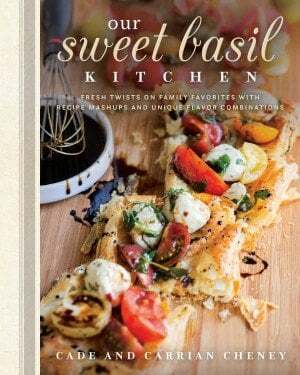 Oh wow, this looks delightful! What I love most about this time of year is all the soups I get to eat! !